People tweet #PorteOuverte to offer shelter after Paris shootings. 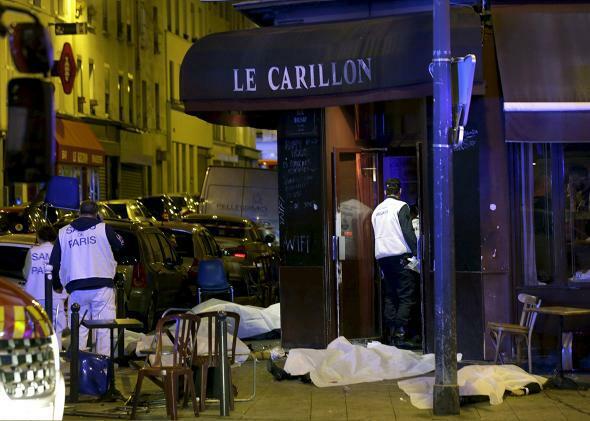 The scene outside a restaurant after a shooting in Paris on Nov. 13, 2015. Internet users are mobilizing on Twitter via the hashtag #porteouverte (open door) to welcome those who are still outside and potentially in danger. In the 10th and 11th arrondissements, where three different shooting attacks took place, residents are tweeting their addresses, saying that people are welcome there, given that gunshots are still being heard in the streets and police have not yet confirmed that the attackers have been arrested. #PorteOuverte please stop tweeting under this hashtag telling them to look at it. It's hard to find somewhere safe when you're clogging it. STOP USING #PorteOuverte - ITS CLOGGING THE FEED FOR PEOPLE TRYING FIND SAFETY. Others worried that people broadcasting their home addresses publicly might unwittingly be putting themselves at risk. Most Twitter users currently opening their residences up as shelters appear to be using a combination of #PorteOuverte and “DM”—Twitter shorthand for “direct message”—in their tweets. For example: “#PorteOuverte with hot food and tea in 15th arrondissement if you need safety please DM.” Those seeking assistance can sift through the noise by searching both the hashtag and “DM” on Twitter’s site.